What is Personal Meeting ID (PMI) and Personal Link? Your Personal Meeting Room is a virtual meeting room permanently reserved for you that you can access with your Personal Meeting ID (PMI) or personal link, if applicable. You can start instant meetings with your PMI, or you can schedule a meeting that uses your PMI. Your Personal Meeting Room is ideal for use with people you meet with regularly. However, because it is always accessible with the same Meeting ID and personal link, it should not be used for back-to-back meetings or people you do not meet with regularly. 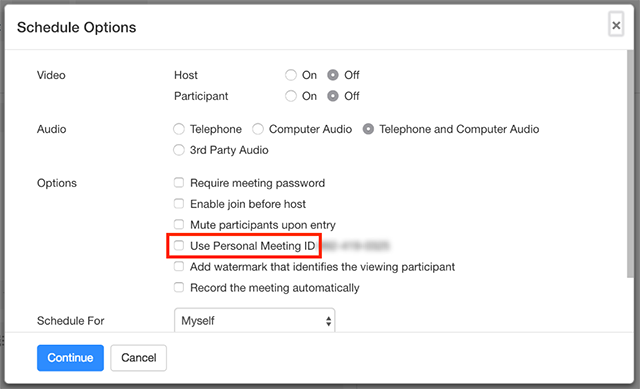 Once a participant has the link to your PMI, they can join it at any time the meeting is in use, unless you lock the meeting or use the Waiting Room feature to admit participants individually. Learn more about PMI and personal link. 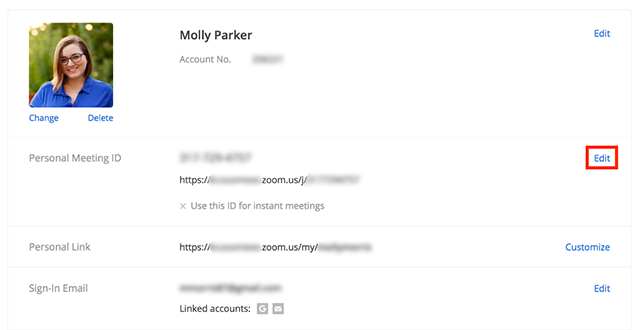 You can set your Zoom profile to always use your Personal Meeting ID for instant meetings. 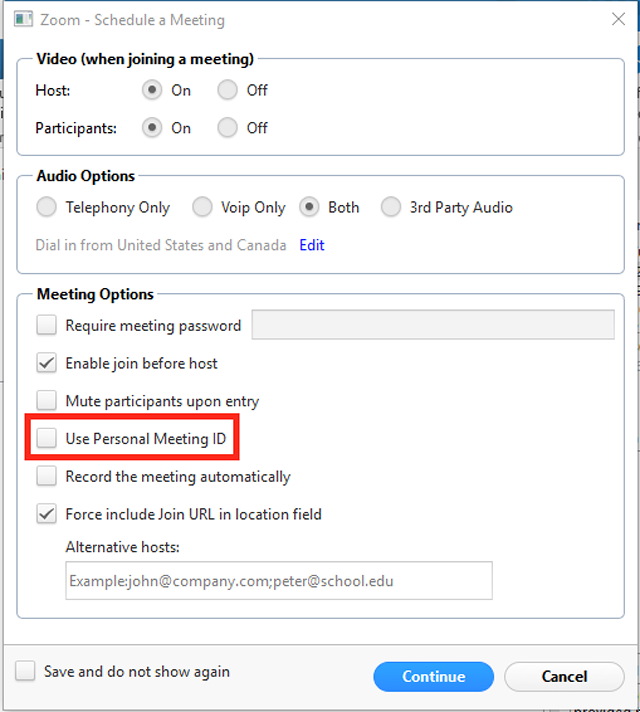 This will lock this setting, so whether you are starting the instant meeting on the web, with the Zoom Desktop Client, or with the Zoom mobile app, it will use your Personal Meeting ID. If you schedule a meeting, you will need to choose to use your PMI. Login to the Zoom web portal and navigate to My Profile. Click Edit next to Personal Meeting ID. Check Use this ID for instant meetings. 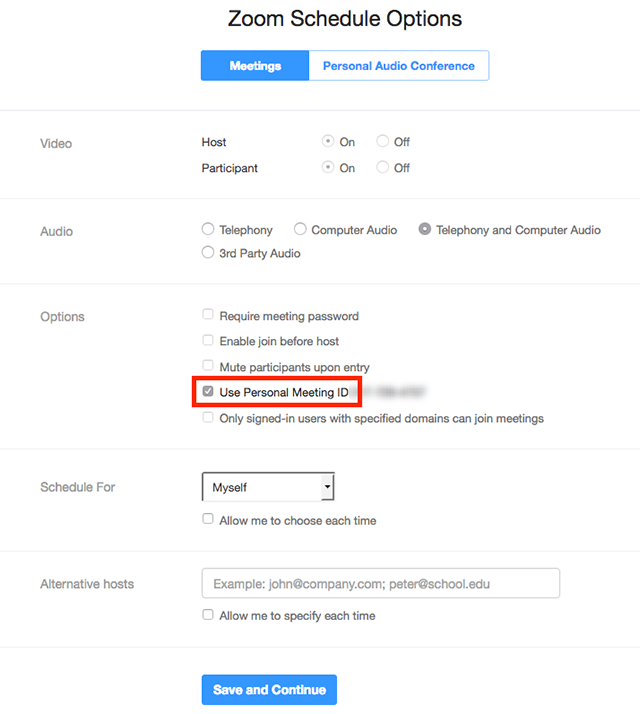 Click the downward arrow beside New Meeting and check Use My Personal Meeting ID. Now when you click Start with Video or Start without Video on this computer, it will use your PMI. Click the arrow next to Advanced Options. Check Use Personal Meeting ID. Under Personal Meeting ID (PMI), click Start. 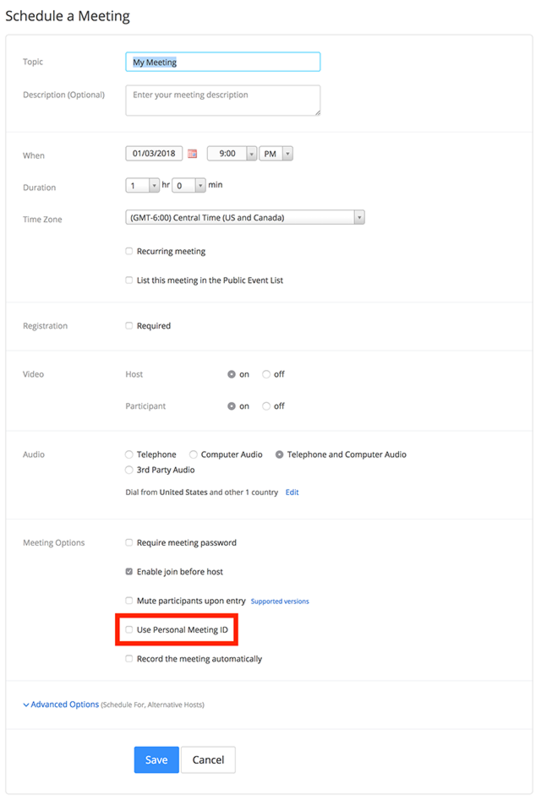 Under Personal Meeting ID (PMI), check Always use PMI for instant meetings on this computer. Login and navigate to My Meetings. This will open up the Zoom desktop client and start your PMI. Click Schedule a New Meeting. Toggle Use Personal Meeting ID to on (green). 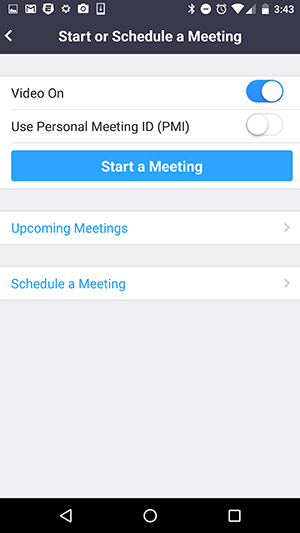 Toggle Use Personal Meeting ID to on (blue). Learn how to schedule using the Outlook Plugin. Click the Schedule a Meeting button. After selecting your other options, click Continue. Add the meeting invitees and Save or Send your invitation. Login to the Chrome Extension. 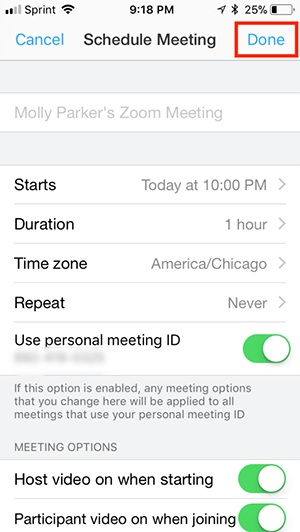 In the Scheduling Options, check Use Personal Meeting ID. After finishing the invitation, click Save. Login to the Firefox Add-on. The Scheduling Options should appear. If the scheduling options don't appear automatically, click the add-on and the gear icon.